..::Big Data Processing and Mining::.. Following the success of previous ICT Innovations conferences, we are proud to announce the 11th ICT Innovations conference, which will be held in Ohrid (Republic of North Macedonia) from October 17th to October 19th, 2019. The ICT Innovations conference series has established itself as an international forum for presenting scientific results related to innovative fundamental and applied research in ICT. The conference aims to bring together academics as well as industrial practitioners, to share their most recent research, practical solutions and experiences and to discuss the trends, opportunities and challenges in the field of Big Data. A number of plenary talks, special sessions and workshops will supplement the main Conference agenda. The focal point for this year’s conference is Big Data Processing and Mining. Big Data is heralded as one of the most exciting challenges in data science and next frontier for innovations. The spread of smart, ubiquitous computing and social networking have brought to light more information to consider. Vast amounts of heterogeneous, multi-modal, noisy and dynamic data are generated from diverse type of applications, such as social media, sensors, Internet of Things, scientific applications, surveillance, video and image streams. Storage, integration, processing and analysis of massive quantities of data pose significant challenges that are yet to be fully addressed. A significant research and development front in the field of machine learning and data analytics has been established. Extracting patterns from big data that offer insights and understanding provides an exciting new platform and objectives for behavioral analytics, predictive and prescriptive modeling and knowledge discovery. By leveraging the advances in deep learning, stream analytics, large-scale graph analysis and distributed data mining, a remarkable number of complex and multi-faceted tasks in fields like, biology, games, robotics, commerce, transportation and health care have been brought within reach. We want to bring some of these topics to the forefront of the ICT 2019 conference. While we anticipate a broad technical program, we are especially interested in papers that address all aspects of big data mining, including algorithms, models, systems, and applications. ICT INNOVATIONS 2019 invites submissions of original and unpublished research papers on all topics relating to data science and Big Data. In addition, we welcome proposals for tutorials and workshops which will be held in conjunction with the main conference. Submissions are to be made through the EasyChair Conference Management System. The submitted papers must be written in English and formatted according to the Springer LNCS/CCIS conference proceedings guidelines. Papers should be limited to 15 pages. All papers will be double-blind, peer reviewed by the Programme Committee, which consists of 250 scientist from 55 countries. If accepted, at least one of the authors must register for the Conference. 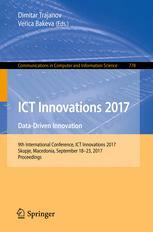 Accepted papers will be included in the Conference proceedings published by Springer in Communications in Computer and Information Science Series (CCIS). The conference proceeding is indexed in DBLP, Google Scholar, EI-Compendex, Mathematical Reviews, SCImago, SCOPUS, and included in Conference Proceedings Citation Index (CPCI). 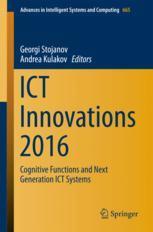 Accepted workshop and short papers will be published in the conference ICT Innovations conference web proceedings. A selected number of accepted papers, in a revised and extended form, will be submitted for possible inclusion in a Special Issue of Informatica (further peer review applies). The conference will be held at the lakefront Metropol Lake Resort in Ohrid, Republic of North Macedonia. Ohrid, a UNESCO Cultural and Natural World Heritage Site, is a city of great historical significance and natural beauty. 180 days until ICT Innovations 2019.